Kick off your visit on the 1st (Wed): ski along the peaceful trails at Levi Ski Resort. Get ready for a full day of sightseeing on the 2nd (Thu): identify plant and animal life at Santa"s Cottage & Pet Farm, then get interesting insight from Tours, then make a trip to LUVATTUMAA - Levi Ice Gallery, and finally explore and take pictures at Ice Karting Levi. For more things to do, reviews, where to stay, and other tourist information, go to the Levi driving holiday planner . Amsterdam, The Netherlands to Levi is an approximately 9-hour flight. You can also drive. The time zone changes from Central European Time (CET) to Eastern European Time (EET), which is usually a 1 hour difference. Plan for much colder temperatures traveling from Amsterdam in January, with highs in Levi at -11°C and lows at -21°C. Finish your sightseeing early on the 2nd (Thu) so you can drive to Akaslompolo. On the 3rd (Fri), look for gifts at Akaslompolo Sportshop, then fly down the slopes at Yllas Ski Resort, and then don't miss a visit to Snow Village. 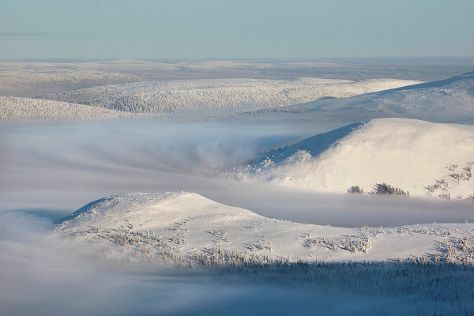 On the 4th (Sat), you'll have a packed day of sightseeing: tour the pleasant surroundings at Pallas-Yllastunturi National Park. To find traveler tips, where to stay, maps, and tourist information, use the Akaslompolo holiday planner. You can drive from Levi to Akaslompolo in 1.5 hours. Alternatively, you can take a bus. In January, plan for daily highs up to -11°C, and evening lows to -22°C. Wrap up your sightseeing on the 4th (Sat) early enough to drive to Rovaniemi. Rovaniemi is known for theme parks, museums, fun & games, nightlife, and historic sites. Your plan includes some of its best attractions: find something for the whole family at Santa Claus Village, engage your brain at Pilke Science Centre, make a trip to Lordi's Square, and pause for some serene contemplation at Rovaniemi Church. To see ratings, traveler tips, and more tourist information, read our Rovaniemi day trip website . Getting from Akaslompolo to Rovaniemi by car takes about 2.5 hours. Other options: take a bus. Plan for somewhat warmer nights when traveling from Akaslompolo in January since evenings lows in Rovaniemi dip to -17°C. Wrap up your sightseeing on the 7th (Tue) to allow time to travel back home.